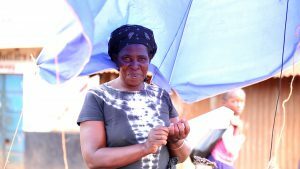 After a day of sitting under the hot sun and haggling with customers over the prices of her goods, the math could not just add up for Margaret Aoko. For a start, she was certain that she had made more cash sales than the previous day, yet she had less money in her hands. For the third time, she poured the crumpled notes and coins from her cash box onto the table to make sure her counting was right. And yet again, the money was less that what she expected. Then it hit her. Could she have given out wrong amounts of change to some of her clients? Could she, in the pitch darkness of Kangemi, periodically lit up by matatu headlights, have handed over a Sh500 note instead of a Sh100 note? Could she have been given a one shilling coin instead of a Sh20 shilling coin? That was the most plausible explanation and at that time she decided something had to give. “A friend of mine had talked to me about M-KOPA Solar but I wasn’t very interested. But after I started losing money in my business, I decided to call her up. Luckily, she found the time to tell me all about it and I can say, I have not regretted since.” Margaret Aoko. M-KOPA solar is a solar lighting and phone charging system consisting of a control box, solar panel, USB phone-charging cable, and three LED lights. The control box itself is a lightweight, hardcover book-sized gadget that has a strong rechargeable battery, a GPS cell modem, LCD status screen, and connection points for a 4-watt solar cell, LED lights, and a USB port. Each M-KOPA Solar device is set with a unique customer ID number that is used to add credit to the user’s account. The idea behind the innovation may be simple but it has helped Margaret solve different aspects of her life. For example, she can work for longer hours, independent from the sporadic and sometimes unreliable street lighting serving the market. “Before I had M-KOPA solar, I would be in the middle of a transaction with a customer and then the lights would go off without warning. Now, I do not worry about any of that. I take my time with customers. I do not rush them around,” she says. Although it is the glue that holds her family together, her grocery store is not the only beneficiary to this. Her six children too have seen the benefit of having a well-lit home. Depending on kerosene for lighting had its own challenges. Every so often, one could knock over the lamp and kerosene would spill into some household essentials. “You would come home and discover that the lamp fell over and landed in the maize flour. There would be no supper on that day,” she says. Plus, there is the little matter of the cost of paraffin. “Today, I do not have to ask my children to walk around with cans or bottles to purchase kerosene. And after I complete my payments, this whole system will be mine and we will not have to spend any money on lighting. This is cheaper than paraffin or electricity.” Margaret Aoko. As darkness rests over Kangemi, Margaret can rest easy, knowing that she can at least play god once in while by lighting up and switching off the lights when she wants. “Nowadays I can even sell up to 11pm,” she says. “All I can do is tell my fellow businesspeople to get with the program. The bulbs do not get spoilt, you save on paraffin costs, you have no electricity bill….after you finish with your payments it is yours. What more could they want,” she says. Late April, M-KOPA Solar, announced the 500,000th home connected to its pioneering solar home systems. Dorothy Nabawesi became M-KOPA’s 500,000th customer when she purchased a M-KOPA 400 system at the M-KOPA Shop in Mukono, Uganda. “I do’t have the money to access electricity. For so long, the good things have been passing me by, like watching national and international news on TV. My grandchildren used to go to a neighbour’s house to get information about the world. Now with M-KOPA, I have better lighting for them to read, plus extra power to charge my phone, listen to the radio and watch TV,” Ms Nabawesi says. The company’s larger solar system that includes a digital TV has been available in Kenya since 2016 and is now also being rolled out in Uganda and Tanzania. Customers can purchase a M-KOPA Solar TV either by acquiring a M-KOPA 400 system, or by extending their $0.50 a day M-KOPA solar home system payment plan and upgrading for more power and a solar TV.